dessert girl: Is There a 12-step program for Yogurt Eaters? I bring Stoneyfield yogurt to work every day. It’s much healthier than other yogurt. They never use any artificial sweeteners, colors, flavors, or preservatives, which means that the yogurt doesn’t contain any yucky high fructose corn syrup. 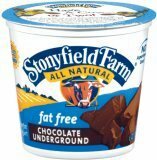 One of my co-workers decided to give it a try and now she’s completely hooked on the Chocolate Underground flavor! She can’t stop talking about how much it tastes just like chocolate pudding! Eager to share this newfound treasure with others, she, in turn, mentioned it to her friend, who has become similarly addicted. Unfortunately, now every time my friend goes to her local grocery store they are completely sold out of Chocolate Underground! This stuff is like crack. Delicious, chocolatey crack! Mmmmm.... They carry Chocolate Underground (and my other favorite Caramel Underground) at Whole Foods market, but to find a grocery store in you area visit their Web site.